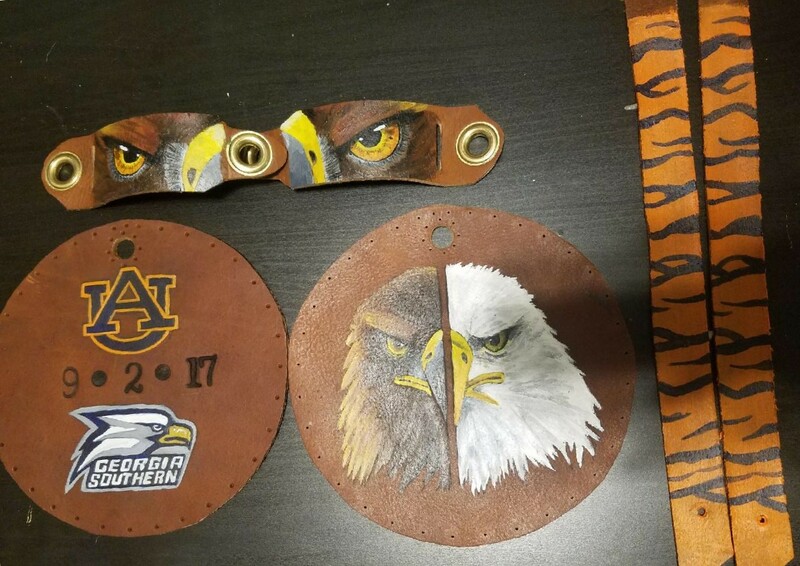 This lure set, made for the Sept. 2, 2017 Georgia Southern game, is a one-of-a-kind unique item for auction that supports the mission of the Southeastern Raptor Center. The Southeastern Raptor Center gives fans the opportunity to own a little piece of the Southeastern Conference’s greatest pregame tradition – the flight of the eagle – by bidding on the eagle’s jess and lure used during its pre-game flights. The time for each auction to open and close will be the same each week: bidding begins at 2:30 p.m. CST and closes at 2:30 p.m. CST for each auction. If a bid is placed within the last 10 minutes of the auction, the auction will be extended another 10 minutes. Money raised from the auctions support the center’s mission of rehabilitation, education, and conservation. Since 2013, the lure auction has more than $40,000 to support the rehabilitation and care of raptors. Our work is only possible through contributions like yours. Your support ensures the preservation of the Southeastern Raptor Center and War Eagle tradition. Your financial support can be made year-round through the Auburn University Foundation by clicking here.